Jake Miller’s face twisted in concentration as he strained to lift the weights. His trainer’s encouragement was loud and friendly. Jake’s right arm, once atrophied from a brain injury suffered in a dirt bike crash, is now as thick with muscle as his unaffected left arm. In the five weeks since the 16-year-old started working out at the gym, his left arm has gotten a lot stronger, too. 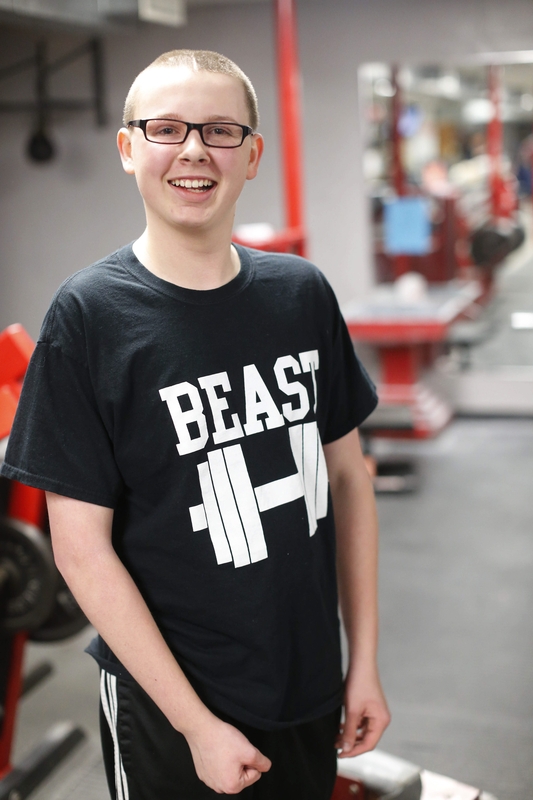 As Jake, in a black T-shirt with “Beast” on the front, paused from his workout at the Steel Mill Gym in Lackawanna, he grinned and proudly flexed. In the year and a half since Jake’s head hit the ground and his brain stopped sending efficient signals to the right side of his body, he and his family have taken an intensive, round-the-clock, marathon training approach to helping him recover from a skull fracture, concussion and bleeding in the brain. Before his injury, he was an active and athletic kid. He’d raced motocross since he was 7, played goalie for the Buffalo Bisons travel hockey team and was boxing at a Lackawanna club. Everything changed on the evening of July 30, 2013, when he flew off his bike and his father found him lying motionless in a wooded section of the Batavia track. After that, nothing was certain. “They told us they didn’t know if he would survive the first 24 hours,” said his mother, Debbie. A Mercy Flight helicopter flew him to Women & Children’s Hospital. While Jake recovered in the intensive care unit with a breathing tube in his throat, his brain swelled so much that doctors had to rush him to surgery and cut off a piece of skull to make extra room to protect his brain until the swelling went down. The bone piece was put in his abdomen for safekeeping until it was later reattached with titanium plates and screws. Jake, then 14, was induced into a coma so that he would remain still while healing. His parents, family and friends prayed. They started a Facebook page. His mother kept a daily journal at the medical recovery blog site caringbridge.org. Weeks later, doctors tried to wake him, yelling, “Jacob, wiggle your toes!” Soon he could squeeze his mother’s hand and open his eyes. “We did not know if he knew who we were,” his mother said. After 48 days in the hospital in Buffalo, he still couldn’t move his body. His mother researched specialized rehab programs and settled on the Children’s Institute in Pittsburgh. Their younger son, Blake, about 2 at the time, stayed with family in Buffalo. Debbie Miller left her job as a project manager for an information technology company, Tim took a break from his work as a repairman at the Ford plant and they all went to Pennsylvania together. The bright, cheerful hospital building, its walls decorated by inspirational messages written by kids, was an oasis. Even though doctors said there was a possibility that Jake would not eat, drink or speak again, therapists got him out of bed and helped hold up his head. After a month of working from 8 a.m. to 4 p.m. every day with speech therapy and music therapy, his body started to work again. Little by little it started to wake up. Soon he was taking little sips of liquid and eating soft food. One day he finished music therapy singing, “You Are My Sunshine.” His mother cried hard. Tears of relief and happiness soaked her shirt. By the time they were ready to leave Pittsburgh in December, her son, who had arrived in an ambulance, was able to walk out with the help of a cane and a leg brace. His doctors have been impressed. Pediatric surgeon Veetai Li said the gradual recovery of his right side is a testament to his drive and his family’s vigilance. “I think his diligence at working at what he needed to do to get better was commendable and that goes a long way,” said Li, who works at Women & Children’s. Now back home in Blasdell, Jake seems a little bit like his old self. He has a smile his mother calls big and gorgeous. “He’s a pretty amazing kid,” Debbie Miller said. Rehabilitation takes priority. Jake takes a couple of classes at Frontier High School and does the rest of his studies with a home school curriculum. He has had speech therapy, occupational therapy, physical therapy, aquatherapy in a pool at a rehab center and acupuncture. “We’re not done trying untraditional methods,” his mother said. On a bright spring morning, his trainer, Larry Opiela, a former body builder, helped his young client grip a weighted pulley with his right hand. Opiela is proud of what they’ve accomplished working together.